Now you can treat headaches using a natural and proven alternative to drugs or medication. The Headache Ice Pillo uses time-honored and medically recommended cold therapy in treating dull, moderate and severe headaches,like migraine and tension headaches. This pillow uses a unique, compact design to help relieve headaches by providing support to your neck while sleeping or resting. An anatomically designed, soft-frozen gel pack can be inserted into the pillow for added relief. 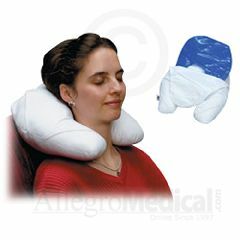 Great for travel, reading or sleeping, this pillow also can provide relief from pinched nerves, stiffness, sprains, neck injuries or other traumas. The gel pack stores in your freezer until needed. Clinically proven to relieve headaches, this pillow was shown to categorically help nearly 80% of uses.